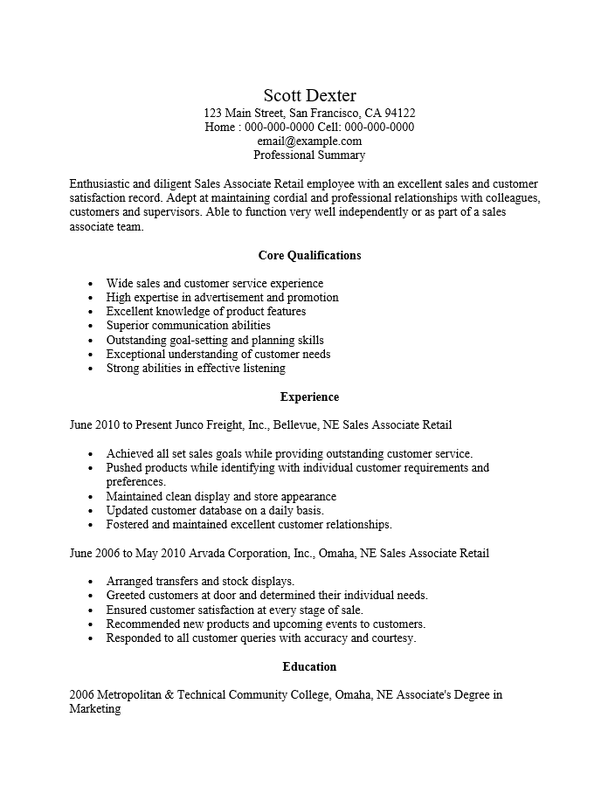 The Retail Sales Associate Resume Template allows those seeking a position in this field the ability to diversify their search by enabling a quick way to duplicate ad revise their resume for a potential employer. This is easily accomplished by using a resume template. Since all the fields and formatting are already present all one needs to do is focus on writing some high quality content. Once this has been done a job hunter is left with what may be referred to as a master template. Then, when an opportunity presents itself they may customize the resume by simply copying and pasting sections that may remain the same onto a new blank template. This will free the candidate to only revise one or two sections before sending it off. While the headings in the resume template will provide an attractive roadmap for job hunters and contribute to a professional look, it is the content that will ultimately cause an interview. Thus it is extremely important that candidates take their time when writing. It is generally encouraged to make an outline beforehand and to embark upon creating content on a day where they will be free from distractions. The more effort placed into developing the master copy the less effort it will take when customizing it for an employer. A resume will be the key document in a hiring entity’s decision making process. Step 1. Input your full name and contact information at the top of the page. Keep this professional looking and aligned with the other sections of your resume. Step 2. Write a summary of yourself. Keep this focused on your professional identity. This should be two to four statements. Step 3. The “Core Qualifications” should act as a bridge between your skills and the job requirements. List applicable skills in a bullet list in this section. Step 4. The “Experience” section will be a list of your past jobs. This should be in descending date order according to the last day you worked for them. Each employer should have the dates you worked for them, their name and location, and your official job title. Below this include a list of what you did there. Step 5. The “Education” section is a place where you list your degrees and certificates. List the date of graduation, where you graduated from, and the official title of the degree.